Soap Making Heaters, Soap Oil Heaters, Soap Making Melting Tanks, Heating Pots and Soap Melters. SWs (SoapMelters Water Jacketed Melting Tanks and Water Jacketed Heaters) are the original thermostatically controlled double boiler style melting tank and heating tank for soap making. & PRIMOs Heat 2-3X Faster! 1. Fast, Precise, Digitally Controlled Safe Heating And Melting Of All Soap Making Materials And Oils Without Hot Spots, Burning Or Damage, including Glycerin, Oils, Butters and Waxes, Melt & Pour Bases, Cocoa Butter, Avocado Butter, Jojoba Oil, Almond Oil, Camellia Oil, Brazil Nut Oil, Olive Oil, Soy, Vegetable Palm Wax, Coconut Butter and more. 2. 100% High-Grade US Steel Construction With 304, #4 Sanitary Polished Stainless Steel Inner Surface That Is Supremely Durable, Non-Porous, Non-Reactive, Corrosion Resistant, And Perfect For Soap Making Since It Will Not Contaminate Oils, Colors or Scents. 3. Insulated Heating Tank Keeps Soap Making Materials Heated Inside And Cool Outside. 4. Heated Ball Valve For Clog Free Operation And Less Wait Time. 5. Round Inside & Square Outside for Faster, Centralized Heating, Easier Cleaning, Superior Insulating And Better Stability. 6. Permanent Heating Elements = No More Replacement Heaters. Melt & Pour Soap Making: Fast, safe & even heating for your melt and pour soap making. 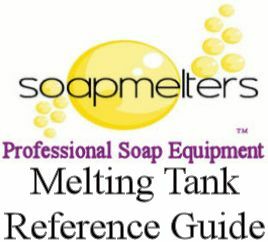 SoapMelters melting tanks and heating pots help dispense your melt and pour soap quickly into your soap making containers and molds, as well as work with our melt and pour dispensing systems for the fastest, easiest soap making. Cold Process Soap Making: Fast, safe heating for soap making base oils and/or to heat your entire batch to mix it at one time. Liquid Soap Making: Hot Process Soap Making: Soap Equipment accelerates saponification so you can quickly and efficiently mix, trace, heat, dilute and bottle your liquid soaps fast & easy. 8. Stainless Steel Lid & Ball Valve Included! 9. 1 Year Warranty & Fantastic Customer Service On All Melters. Save Time Heating Your Oils and Melting Your Soap Mixtures Fast! Most Melters In Stock & Ready To Ship! Fast Heating 10 Gallon (37L) Stainless Steel Melting Tank Includes Stainless Steel lid, ball valve, sight glass, temperature gauge and release plug. Does NOT include heating element. Fast 70 Gallon (264.98L) Soap Mixture Melting Tank Includes Stainless Steel lid, ball valve, sightglass, temperature gauage and release plug. Does NOT include heater. Only 1600 Watts but Heats 2-3X Faster than any 100 Gallon Water Jacketed Melter-120V! 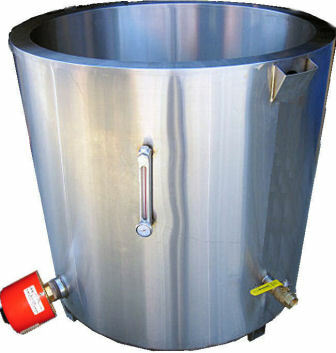 Industry's Fastest, Most Powerful 153 Gallon 1000lb (453.60kg), Soap Melting Tank Includes Stainless Steel Melting Tank Includes Stainless Steel lid, ball valve, sight glass, temperature gauge and release plug. Does NOT include heating element. Only 1800 Watts but Heats 2-3X Faster than any 150 Gallon Water Jacketed Melter- 120V! This Eco-Friendly Melting Tank is the Industry's Fastest, Even Heating, Energy Efficient, Digitally Controlled 316Gallon (1200L) 2000lb (910kg) Modified Direct Heat Melter! Only 8200 Watts- 220 V! This Eco-Friendly Melting Tank is the Industry's Fastest, Even Heating, Energy Efficient, Digitally Controlled 950 Gallon (3600L) 7500 lb (3402kg) Modified Direct Heat Melter! This Eco-Friendly Melting Tank is the Industry's Fastest, Even Heating, Energy Efficient, Digitally Controlled 1268 Gallon (4800L) 10000 lb (4536kg) Modified Direct Heat Melter! This Eco-Friendly Melting Tank is the Industry's Fastest, Even Heating, Energy Efficient, Digitally Controlled 1566 Gallon (5927L) 12000 lb (5445kg) Modified Direct Heat Melter! This Eco-Friendly Melting Tank is the Industry's Fastest, Even Heating, Energy Efficient, Digitally Controlled 1957 Gallon (7412 L), 15000 lb (6804kg) Modified Direct Heat Melter! Soapmelters, your intelligent partner in the soap making industry is proud to offer the most extensive line of superior, reliable melting and heating tanks and pots in the industry for Soap making materials and substances including Waxes, Oils, Glyercine and Butters like Soy, Vegetable Palm Wax, Soap, Gels, Honey, Coconut Butter, Cocoa Butter, Avocado Butter, Jojoba Oil, Almond Oil, Camellia Oil, Brazil Nut Oil, Olive Oil and more! Before you became a professional soap maker, did you ever melt your soap mixtures in your oven? Of course not because air is not an efficient conductor of heat. You used a stove top pot (direct heat melter) or double boiler (water jacket melting tank). The laws of physics are the same today as they were when you were a beginner: air is an inefficient method of conducting and transferring heat, so why would you use a convection melter? Bottom Line: If convection melters were good for soap making, we would sell them. We don't take chances with your handcrafted soap making business. Convection heated melters transfer heat by air and as you would imagine, the heated air must be circulated so temperature is difficult to maintain and requires Convection Heated Melters to be insulated. In contrast, our Direct Heat Melters are in direct contact with your substance so that is the most energy efficient. In our water jacket melters, our immersion heaters are directly immersed in the water they heat on a horizontal basis to allow for better disbursement of heat within the water jacket melting tank. Since all the heat in our water jacket melters is transmitted directly from our immersion heating element to the water, this direct heating makes the immersion heater from heating element to the water virtually 100% energy efficient. Compare them at home: try baking and boiling the same food- which one is more efficient? Try cooking any egg, potato, carrot, etc by submersing it in small pot of boiling water and cooking the same item in a 212 degree oven and see which cooks faster. Obviously, the longer it takes to cook, the more energy you need to use and pay with higher energy bills. While a convection oven may cook better than a conventional oven, both cook by heating air which is why when you cook you almost always need the temperature of the oven to be much hotter than say, boiled water at 212 degrees. Which would cook an egg faster at 212 degrees? Which would cook potatoes faster at 212 degrees? In fact, most ovens require the temperature to be at over 300 degrees before they can cook. Plus, since it heats using air rather than water, your oven needs to be insulated more than the pot of water you are boiling. This is very similar to the differences between our water jacket melters and convection melting tanks. Compare a forced air heating system to a radiant heating system: which one is more efficient? Which provides a better source of consistent heat? Which one actually heats a home rather than warms up the air? Have you ever noticed how long it takes for your couch or bed to heat up when using a forced air heating system? We are sure you notice that no matter how hard you blast your forced air heater, it still gets cold once you shut it off. That is why you constantly need the heater running. Also, which is normally a more expensive system- a radiant heater or forced air heater? Obviously, radiant heat, yet people sell Convection Heated Melters for more money than our more efficient, more reliable immersion-water based heated melting tanks. Set your oven to 212 and then boil a pot of water with the lid on it. Then shut them off. Notice how the boiled water stays hotter much longer than your oven, which means that when you heat up your immersion-water based melting tank it will stay warmer without using electricity for a longer period of time than a Convection Melting Tank. Since water maintains its heated temperature much better than air, then a water jacket melter will maintain its temperature and use less energy than a convection melter. Therefore, immersion heating elements in a water jacket melters and melting tanks are far more efficient, reliable and effective for heating your waxes, soaps, oils, and any of your products than convection melting tanks and heaters. Have you ever boiled a potato and noticed that one side burned while one side was under cooked? No, neither have we. On the other hand, have you ever baked a potato and burned only one side while the other side was undercooked? Unfortunately, we all have had this experience. Just take a frozen hot dog and put one in the oven at 212 degrees and boil the other. Which one is uniformly heated and which do you need to turn? Do yourself a favor and just put them both in the boiling water to save yourself plenty of aggravation. Some companies that sell convection heating tanks and melters claim that immersion based water jacketed melters depend on maintaining water level for even heating? Yes, just like when you boil a pot of water you should make sure you put water in the pot. Just like when you drive a car you should make sure you have gasoline since that will evaporate also. With our water jacket melting tanks, so long as the lid is on there is relatively little evaporation and since our melters all come standard with an efficient pouring hole and a tube, so you can use our water jacket melters with simple monitoring since they minimize evaporation. The heating element in a convection melter can catch fire! That's pretty dangerous when you are making candles. In fact, some companys became our customers because melting tanks they purchased from other companies have caught fire. Not only are all our products tested for safety, we refuse to sell a product which we feel has a propensity to catch fire so we refuse to sell convection melting tanks, convection melters and convection pots. From a safety perspective, the main difference between a water jacket immersion based heating tank is surrounded by water reduces the chances of fire. Furthermore, even if you forget to add water, the immersion heating element in our water jacket melters should simply burn out. Please remember that when using any melter, all melting tanks and the wax, soap, gel, oils and molten products they heat can all potentially cause burns and/or fires. Obviously, once the heating element in the water jacket melter heats the water in the tank, the water is also hot. Please never operate any melter without proper safety equipment and without following the saftey precautions on our website. 1) Who is going to watch my product in the tank and dispense it? 2) Why do you have a warning label which states that I should not leave my melter on and unattended since the melting tank and heated, molten products are burn and fire hazards? Obviously, from a point of safety, you should never operate a melting tank, melter, heated pot and any molten products without safety gear, equipment and never leave them on while unattended.